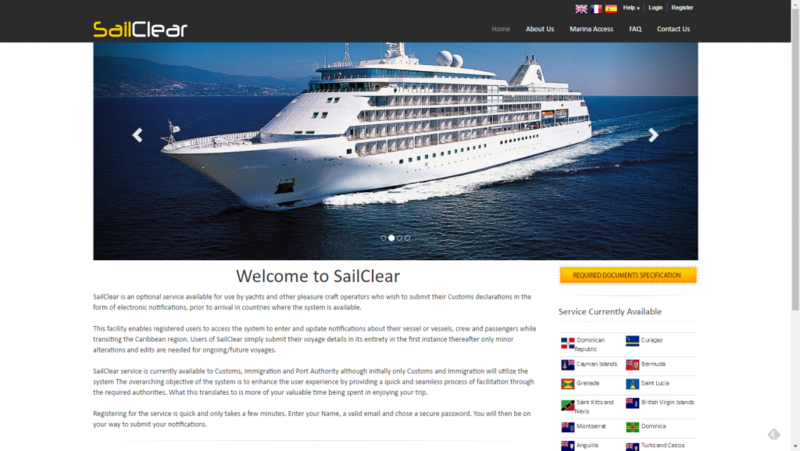 SailClear was developed by the Caribbean Customs Law Enforcement Council in 2013.The online system was designed to meet the clearance requirements of Customs, Immigration and Port Authorities throughout regional territories. The SailClear service allows a user to freely sign up by registering for a user account. Once this account is activated a user can begin entering his voyage details and other information related to crew, passengers and stores. This submitted information is immediately available to Customs and other authorities, therefore the notification process through SailClear can be done any time prior to arrival. On arrival, the yacht captain is still required to present himself to authorities at the port of entry bearing essential documents such as passports and vessel registration information. During processing, the Customs and Immigration officials will electronically retrieve the submitted information and will verify and print the official declaration forms generated from the system in this way, the yacht and crew information is processed electronically from the pre-submitted information rather than using the traditional handwritten forms. This seamless process results in a reduced processing time for individuals. The system has been designed to be user-friendly and easy to use. The benefit is realized through subsequent voyages, since only minimal edits of previously entered information is needed in order to create new entries. In a nutshell, SailClear is a quick and efficient way to clear in and out of the regional ports. It allows the captain to send required information to border agencies before arrival or departure.